TriClear - Out Of Business, But What To Use Instead? The Triclear acne treatment system consisted of three products, a purifying cleanser, a repairing gel, and a revitalizing cream. Triclear was a well-received product that worked and most customers liked it. Unfortunately, the company has gone out of business and Triclear is no longer available. So what can Triclear customers use instead? To get the same benefits as the TriClear Acne system, you will need to buy a a good cleanser, a good repairing gel, and a good revitalizing cream. TriClear was a great acne treatment system. Unfortunately, the company has gone out of business. You can get the same acne treatment benefits in two different ways. One way is to buy a good cleanser, a good repairing gel, and a good revitalizing cream. This site makes suggestions for these products. A more cost-effective way to get the benefits of TriClear is to buy an acne treatment system. Olay’s acne treatment system is a good choice if you have both adult acne and wrinkles. Exposed Skin Care offers more product at a lower price and is a better choice for teen acne or adult acne without wrinkles. Especially for teens who have mild to moderate acne, finding the right cleanser for acne is fundamental. Fortunately, there are a number of really good cleansers for acne-prone skin that don’t cost a lot. Neutrogena Oil-Free Acne Wash Foam Cleanser costs just US $6.99 per 5.1 ounce/153 ml bottle. The longer you can leave it on your skin before you rinse it off (about 5 minutes would be ideal), the more it will break up the gunk that holds hardened sebum tight in blackheads and whiteheads. It will also help reduce redness in pimples—but this will take about a week if you are a teen and longer if you are an adult. Paula’s Choice CLEAR Normalizing Cleanser Pore Clarifying Gel is a little more expensive, US $10.99 a bottle, but you get a little more product per bottle (6 fluid ounces/180 ml) than you get in the Neutrogena product. This cleanser contains triclosan to kill acne bacteria and gets makeup off skin without scrubbing. 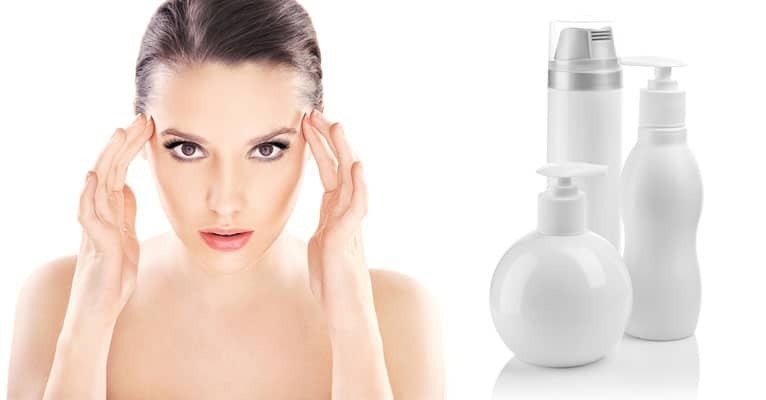 Serious Skin Care Daily Ritual Acne Skin Care is a lot more expensive, at US $21.00 for a 4 ounce/120 ml bottle. The advantage of this product is that it contains jojoba beads and polyethylene scrubbers that can help break up blackheads, smooth the edges of scars, and lighten brown spots. It’s important to keep the product out of your eyes. TriClear was also famous for its acne repair gel. What you are really looking for in a “repair” gel is a moisturizer. The purpose of a moisturizer is to keep tiny amounts of water in the outermost lining of your skin. The skin naturally locks moisture to protect the tissues beneath it, but it makes small amounts of natural chemicals known as aquaporins to help the skin absorb just enough moisture to stay soft and keep pores open. Good moisturizers contain “moisture,” of course, without the addition of skin-drying ingredients like alcohol, but they also contain skin-identical ingredients to carry moisture inside. Lubriderm Intense Skin Repair Calming Skin Lotion is a good budget choice for a calming skin moisturizer. It contains a tiny amount of hydrocortisone for itchy skin without any fragrances or perfumes that could trigger new skin reactions. And at US 8.49 for 16 fluid ounces/480 ml, buying this product won’t bust most budgets. Dermadoctor Handy Manum Medicated Skin Repair Serum with 1% Hydrocortisone is a good choice for itchy skin. The 1% hydrocortisone stops inflammation and relieves redness, but is not so strong that it would thin the skin. There are a number of ingredients in this product that are associated with repairing skin damage caused by acne, but they are not at the right pH. Still, this repair serum is a great way to moisturize dry, itchy skin that tends to form whiteheads and tiny pimples. Paula’s Choice RESIST Barrier Repair Moisturizer, Skin Remodeling Complex is not cheap. It costs US $22.95 for a 2 ounce/56 gram tube. But it is loaded with ingredients to repair the skin. This product includes skin-identical ceramides that act as the “mortar” to keep the “bricks” of skin cells stuck together outside pores, and palmitoyl oligopeptides to help the skin retain and release moisture at just the right rate. It increases the lubrication of the skin with glycerin and also provides about a dozen antioxidants. This Paula’s Choice product is helpful for any kind of skin and any kind of skin problem, including acne. TriClear’s revitalizing cream was really a toner, helping stop flaking skin, especially when users got too much sun. Several products on the market also do this job. NuSkin NaPCA Moisture Mist contains aloe and skin identical ingredients you can spray on your skin to encourage healing of broken skin. It is an especially good choice after you have popped pimples or squeezed blackheads (not that you ever should). This product retails for US $10.93 for 8.4 fluid ounces/252 ml. Olay Regenerist Regenerating Serum Fragrance-Free stimulates the production of ceramides in the skin with the B vitamin nicotinamide, which makes up 2% to 3% of the product. Cermamides help keep healthy skin “glued” together so that flaking and peeling are mimimized. It also contains silicones that leave the skin feeling silky smooth. This product retails for US $23.99 for a 1.7 fluid ounce/51 ml tube. Paula’s Choice Skin Balancing Daily Mattifying Lotion with SPF 15 & Antioxidants, for Normal to Oily/Combination Skin is a great choice if your big problem is rough skin. It adds a nice even matte finish to your skin so you can cover up acne without having to cover up your cover ups to keep bumps and rough skin from being too noticeable. This product retails for US $20.95 for 2 fluid ounces/60 ml. What About Other Acne Treatment Kits? If you buy three different good skin treatment products to replace TriClear, you will spend about $60 plus tax, shipping, and handling. But you can save money by buying acne treatment kits. Olay Pro-X Clear Acne Protocol Kit offers a combination of three products quite similar to TriClear. All of them contain 1% salicylic acid, which is ideal if you have adult acne and you are also fighting wrinkles. To get the best results from this product, however, you really need to leave the cleanser on your skin for about 5 minutes if you can. You get three bottles of product for US $47 plus shipping and handling. A better approach for teen acne (or any kind of acne without wrinkling) is Exposed Skin Care. They offer 5 bottles of product for US 49, with free shipping, and have travel kits for as little as US $29.